Recent Activities provided much comfort, help and hope to the clients served by St. Francis Food Pantries and Shelters. Our Eleventh Annual "Thanksgiving in February" Luncheon was held in the Church Hall at The Church of St. Paul the Apostle for over 500 clients from several Food Pantries we help support. John Catsimatidis and Con Edison were the Presenting Sponsors, and Macy's was the Food Sponsor. 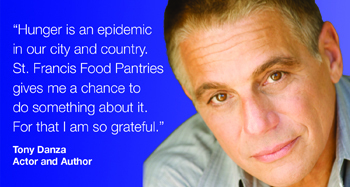 Actor and author Tony Danza and Talk Show Host of the Wendy Williams Show, Wendy Williams joined over 80 volunteers from Macy's and Con Edison to help serve a complete traditional Thanksgiving meal. Ross Stores continued to donate hundreds of new coats and winter wear to help keep the less fortunate in the New York area warm and dry in the cold weather. Abigail Garcia, Operations Supervisor coordinated the generous donation. Over 500 homeless and shelter residents in St. Francis Food Pantries and Shelters network were treated to the Annual "Dinner for the Needy" in Midtown Manhattan. June Tang How and a corps of over 40 volunteers helped prepare the meal sponsored by St. Francis Food Pantries and Shelters. Guests also received new winter coats, and toys were distributed to the children at this party. Hundreds of cases of canned goods, non-perishable items and frozen meat were delivered to the Food Pantries, Soup Kitchens and Shelters in our network, as part of our "Stocking the Shelves" program. The Durst Organization, Jones Lang LaSalle and Mary Anne Fusco from Prudential Douglas Elliman conducted Drives for St. Francis Food Pantries and Shelters, collecting baby items, diaper, and coats. National Grid turned their employee "spirit building day" event into a very generous donation of over 150 cases of canned goods to our Food Pantries in Brooklyn. Jim Madej, Senior Vice President & Chief Customer Officer offered to help St. Francis Food Pantries and Shelters by donating the canned goods from their "Create a Miniature Golf Course" competition held at a Hotel in Brooklyn. Our St. Patrick's Day Luncheon was served "a wee bit early" to over 400 seniors at A Senior Community Service Center in the heart of the Theatre District. John Catsimatidis supplied the food for this corned beef and cabbage meal, along with all the trimmings. In addition to the meals served in the Senior Center, and an additional 800 meals were prepared and delivered to their home bound clients. 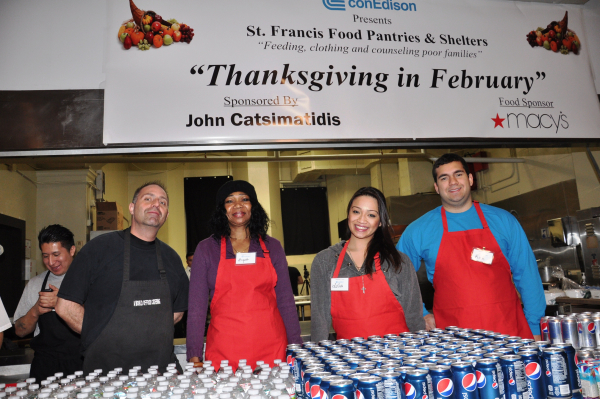 Macy's presented the event for St. Francis Food Pantries and Shelters, and their volunteers helped serve the meal. Rosanna Scotto, Co-Host of FOX5's "Good Day New York" stopped by to speak to the seniors, and mentioned the event on her show the following day. (See the video clip in the full story). St. Francis Food Pantries and Shelters graciously thank the corporate donors, volunteers and generous individuals who allow us to help serve the less fortunate throughout the New York area.